The first time I tried real carbonara was in Rome on a rainy day. The restaurant was empty and the sound of rain hung in the air like the backdrop to a great movie. Use the best ingredients you can find, including farm fresh eggs and locally sourced pancetta from a butcher. For the pasta, it’s not traditional but I like an interesting shape like lumaconi rigati because they are more durable when making the sauce and the salty pieces of pancetta get stuck in the sloped opening. 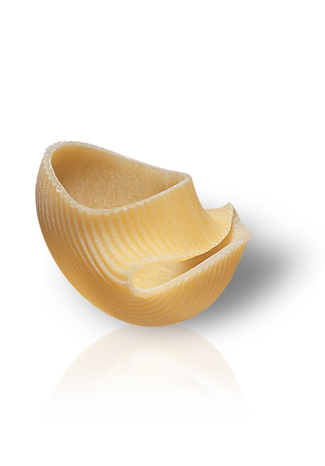 You should be able to find this pasta shape at nicer grocery stores. Use a food processor to grate cheese in seconds. 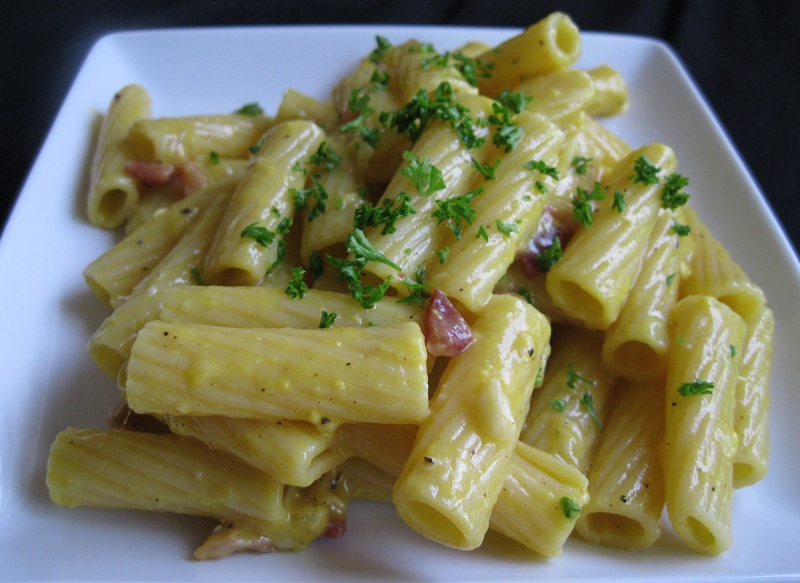 What makes carbonara so special? Read this article on the facts behind the food and then see pictures of me cutting an 80 lb wheel of Parmigiano Reggiano. Foodie Note: This recipe is easily prepared in 30 minutes on a weekday evening. 1) Dice raw pancetta, chop parsley, grate cheese. In a bowl, combine eggs, cream, a few cracks of pepper, a pinch of salt and 2 tablespoons of parmesan; whisk together and set aside. 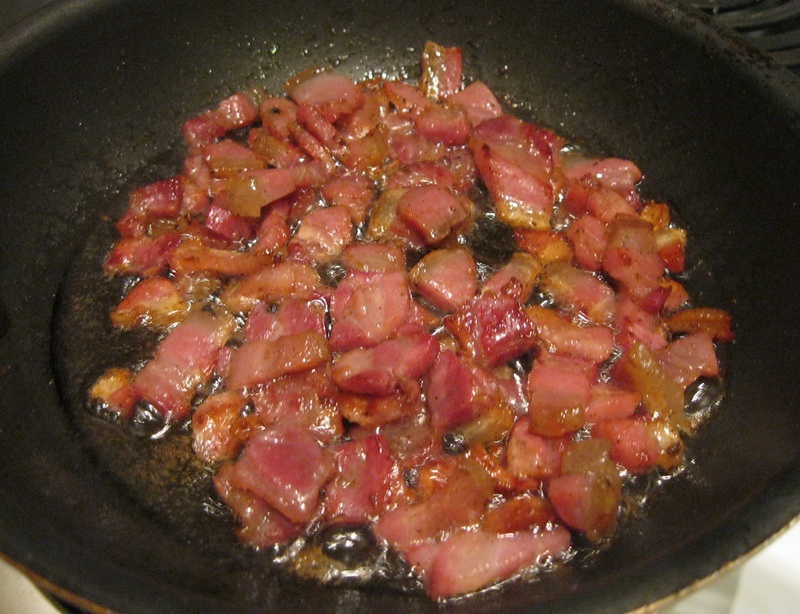 2) Heat oil in a skillet to medium until it just begins to ripple in the pan, add pancetta, cook about 8-10 minutes until brown. Add a few cracks of pepper while sautéing. Set aside, in a small bowl, without drippings. 3) Liberally salt a pot of boiling water, add pasta. Just before pasta is cooked, take a measuring cup and scoop about 1/4 cup of the pasta water; set aside. Strain pasta into colander then pour pasta back into pot taking it off the hot burner; add 1 tablespoon pasta water back into pot. Stir. 4) Mix 1 tablespoon reserved pasta water into the beaten egg/cream mixture, slowly add to pasta, stirring constantly. Add the cheese and lots of fresh pepper; continue to stir until the pasta thickens, about 3 minutes. If the pasta seems dry, add a little reserved pasta water and stir until the pasta is slightly sticky, cheesy and well coated with sauce. 5) Divide onto 4 serving plates, garnish with parmesan and parsley.